Since 1997, Global Aviation (GR-ATO-102) has been offering Commercial and Private Pilot Training Courses. 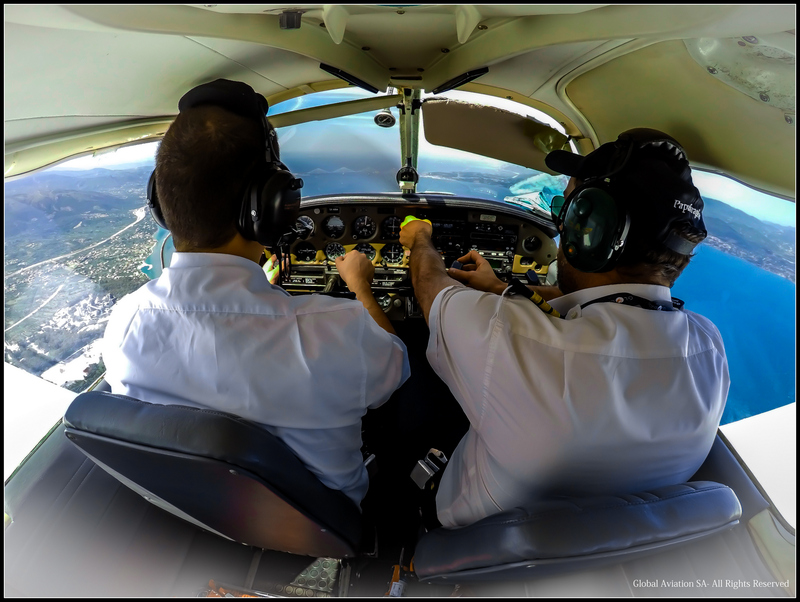 Global offers Integrated and Modular Courses for the Airline Transport Pilot (ATPL) and Private Pilot (PPL) Licenses as well as the Instrument (IR), Multi-Engine (MEP), Flight Instructor (FI) Ratings and Multi Crew Cooperation (MCC) Courses. Moreover, Global is a certified test centre for the ICAO Level 4 Aviation English Language Proficiency Test (LPT), offering exams throughout the year. Global Aviation SA was founded by a group of aviation experts in 1997, having its base in Athens, Greece. The company acquired Aegean Aviation’s general aviation assets (maintenance base, fleet etc) and expanded rapidly, acquiring a fleet of new and pre-owned single and multi-engine Piper aircraft. Due to the Athens 2004 Olympic Games, the company’s flight training base was relocated to Pachi Airport, Megara (LGMG), Greece’s major general Aviation airport. Since its incorporation, Global Aviation has a mission of offering top-quality services in the fields of, pilot training, aircraft maintenance and aircraft sales. Global Flight Academy is the oldest pilot academy in Greece. Having its administrative and ground school base in Piraeus and its flying base in the Civil Aviation Airport of Pachi, Megara (LGMG), Global Flight Academy has been training pilots for private and commercial courses, since 1997, when it was approved by the Hellenic Civil Aviation Authority (HCAA). In 2004, the Joint Aviation Authorities (JAA) inspected and approved Global Flight Academy as Flight Training Organization (GR-ATO-102), according to Joint Aviation Regulations (JAR). In 2012, the academy adopted the European Aviation Safety Agency (EASA) Part-FCL standards. Global Aviation is approved by the HCAA and EASA to offer Cabin Crew Training Courses as GR-CCTO-102. All theoretical training takes place in Global Aviation’s ground school based in Piraeus. The courses’ practical training takes place in approved locations including the Athens International Airport in accordance with HCAA and EASA. Global Aviation offers 3-months long initial cabin crew training courses designed for individuals who wish to follow a career as cabin crew in the dynamic aviation industry and intensive cabin crew courses that can be tailored to meet the needs of domestic and international airlines. Global Maintenance Centre is offering top-quality aircraft maintenance solutions. Having its base in the general aviation airport of Pachi, Megara (LGMG), Global Aviation is certified by the HCAA and EASA to offer maintenance services for single and multi-engine piston aeroplanes, as Maintenance Organisation EL.MF.004. Moreover, Global Aviation is a certified Continuous Airworthiness Management Organisation (CAMO), offering continuous airworthiness management services for single and multi-engine piston aeroplanes as CAMO EL.MG.039. Global Aircraft Sales is the exclusive distributor of Piper Aircraft in Greece, Cyprus, Romania and Bulgaria, as well as a sales agent of Bombardier Business Jets in the region. Moreover, Global provides clients with a variety of carefully selected pre-owned aircraft that range from single-engine piston aeroplanes to luxury business jets. Moreover, having significant expertise in Aviation Consulting, Global Aviation provides clients with solutions including purchasing, owning, maintaining and operating their aircraft.